I was born on March 5, 1979 in de Vondellaan in Helmond. At the age of fifteen i started painting, accompanied by the artist Jo Goossens. At this stage I mainly painted landscapes and portraits. It wouldn't take long before I discovered the abstract art. 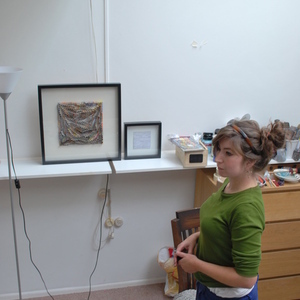 Turning 20, I moved to Den Bosch, for studying at the Academy for Art and Visual communication. After my graduation in 2002 I changed course and started to work as a freelance artist. In the following years I created hundreds of designs such as wallcovering, textile and giftwrap designs and are being sold around the world, my work is presented anually at fairs like indigo Brussels and Surtex New york. For my paintings my main source of inspiration is nature, with all it's great shapes, textures and colors that form a world of ever-changing beauty. With my work I attempt to create a bit of nature of my own, i do that by creating a simple form or shape as a building brick and using it in a sort of repetitive manner, as if my paintings are growing structures, I create movement. As a reult my work has an organic feel to it.